We are looking for a highly motivated, adaptable and conscientious Registered Pharmacy Technician to join our existing team. The successful applicant will have experience of Hospital Pharmacy along with accreditation as a checking technician. 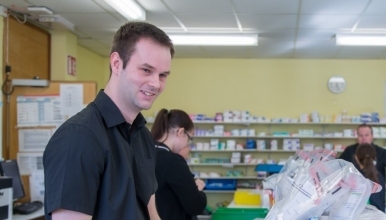 We are a department that is committed to the extended role of technicians, and you will be encouraged to develop your skills in all aspects of hospital pharmacy practice in our busy progressive department. Your duties will be rotational between our established clinical services (complete medicines reconciliation reviews, dispensary services, technical checking, high-cost drug reclamation, clinical trials), and within our aseptic unit. Medicines Management Systems are highly integrated into electronic IT systems, with Pharmacy technicians involved in "at the bedside clinical services", assessing Patient Own Drugs (POD), taking patient medicine history, one-stop dispensing. Training opportunities in clinical and technical pharmacy from certificate to degree level are actively encouraged.